I Love cats of all types whether they be moggies or pedigrees. They have been a part of my life for as long as I can remember though since I had always shared my home with strays, interlopers or rescue cats, I had experienced the nature of a true pedigree cat That changed in 2008 when having lost my three eldest cats ( 2 at 21 and 1 at 20) over an 18 month period I found myself with a vacancy which was filled when one of my customers was returning to Australia and needed a home for her 4 year old Siamese. Chocky has lived us ever since and we have rapidly learned that Siamese cats are quite unlike any other feline companion I have had the pleasure to spend time with as he is adorable, mischievous, frustrating, loving, infuriating, incredibly intelligent, annoying, hysterical, proud, and downright obstinate when he feels like it. 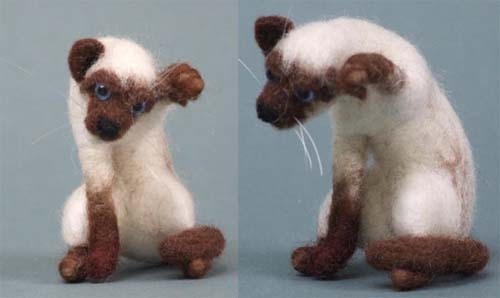 As a result I have been inspired to recreate a few of his many poses in felt, this shows him taking a bath.